And that’s it! That’s the end. Everyone depressed and distraught forever. OMG, what is WRONG with this story? The artwork is so lovely, so beautiful. Subtle colors and lines, pretty little details of forest flora and fauna. 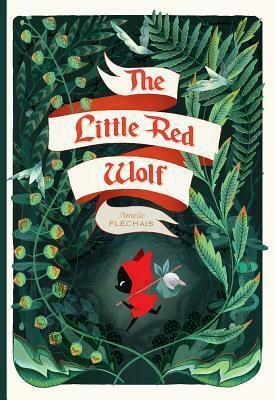 The beginning is whimsical and sweet as a little wolf travels through the forest to take a dead rabbit to his grandmother’s house. He follows a butterfly, and explores a little mousey hole, and stops to look at a beetle. First of all, dead rabbit in every scene, just laying there in the basket, being dead and all. Also, the little wolf gets hungry and decides to eat just one of the rabbit feet as a snack. Oh, yum. Dead bloody rabbit feet. Never mind the bones. Then he meets a mysterious little girl, who promises to help him, and in his childish innocence he is led away by her charms. And the plot gets very dark, and then it’s just killing and murder and the evil past of the little girl’s father, the Hunter, is explained. Macabre to the point that it was actually disturbing to read, and I’m an adult! I could never read this to a child! The worst of it is, that even with this darkness in the story, I can see the potential for a happy resolution and the possibility of a little lesson about forgiving your enemies or something. But instead, we are left with no real resolution, everybody is hateful and murderous, and the only lesson is that some people are just violent and there’s nothing you can do except stay away from them. Which is certainly a good warning that applies to real life, but not what I want to read in a bedtime story. Such a waste of beautiful illustrations. Disclaimer: I received an ecopy of this book from the publisher through NetGalley in exchange for a free and honest review. All the opinions stated here are my own true thoughts and are not influenced by anyone.